To achieve successful social entrepreneurship, one should be “even more” creative and innovative as such endeavors seek not just to make profits but also to create a better society, Penny Low, founder of the Social Innovation Park, said in an interview with The Korea Herald on Monday. Low has been leading the nonprofit organization that promotes social entrepreneurship. 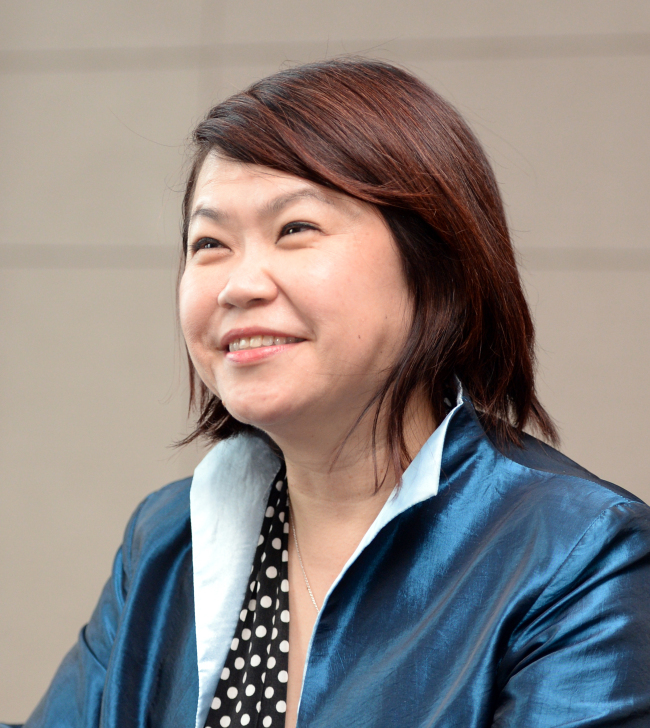 She was also a member of the Parliament of Singapore for almost 15 years. Low was in Seoul to attend and deliver a key note speech at Global Entrepreneurship Week 2017. “Charity is a hand-out, and there are certain organizations that need funds from outside. But social enterprise is more about (a) hand-up. If a social entrepreneur has right causes, people and funds will automatically follow,” Low said. Calling social entrepreneurship “compassionate capitalism,” Low underscored that education from an early age is key to fostering social entrepreneurship that can solve disparity. The following are excepts of the interview. Korea Herald: Can you elaborate a little more about Social Innovation Park, which you founded? Low: The vision of Social Innovation Park is to build a more inclusive, sustainable and mindful world by providing platforms for collaborations and partnerships. SIP is not dependent on any government funding. It’s completely privately funded. Many of the initiatives are ground-up initiatives rather than top-down initiatives. It has been around for 11 years now and given birth to some 100 social enterprises. KH: What would be the three important attributes for social entrepreneurship? Low: It’s very simple. For social entrepreneurship, you just add, “even more” in front of them. Social entrepreneurs should be even more creative, even more innovative. If it was so easy, it would have been done long time ago. It’s harder because you are not just looking at a single bottom line. You are looking at double or triple bottom lines here. It’s not only about making money. You have to make money and do good at the same time. So isn’t that harder? But there is another thing that has to be there. Compassion. Social entrepreneurs need to have compassion for everything. You need to have compassion for your fellow human beings, animals, environment and etc. Therefore, another name for social entrepreneurship is compassionate capitalism. KH: On the back of the “fourth industrial revolution,” there are growing concerns that the disparity between the rich and poor might extend further. Can social entrepreneurship counter the disparity issue? Low: In the short term, you use negative tax system and fiscal policies to address the income distribution gap. For the long term, only people can help people. Therefore, you educate. The Singaporean government does a fairly good job looking after the have-nots. The bigger issue in question is how you cultivate a sense of self-reliance, a sense of mutual help and a sense of resilience within the current generation. And most of all, how do you cultivate a sense of compassion and love for fellow human beings in this generation. For that we are embarking on a series of value driven education in schools. Starting at a very young age, they must learn to collaborate with each other, they must learn about values that society espouse. KH: Can you think of any social enterprise models that use technologies such as artificial intelligence, the Internet of Thing or big data analytics? Low: There are many medical-tech startups that are getting to the space. Scanadu is an example. Scanadu’s mission is to make this the last generation to know so little about its health. The company might not have started as a social enterprise, but it clearly has social missions itself. They are not there just to make plenty of money, they are really there because they believe in creating something that is beneficial for mankind. KH: Any advice for countries that are currently on the beginning stage of developing education programs designed to help social entrepreneurship settle in? Low: Find the right person to spearhead. It’s very important -- the person who is going to make the decisions. The person must be experienced, skillful, passionate and persistent. Then the champion cannot exist alone. He needs a team. The whole idea is that you have to get these people together so that you don’t have to re-invent the wheel on everything.